Detour, a new iOS app that gives audio tours from San Francisco insiders, is creating some buzz and it's going to eventually roll out to other cities. Former Groupon chief executive Andrew Mason created the app after he noticed that many of the walking tours at Groupon sold out, he told Press:Here. 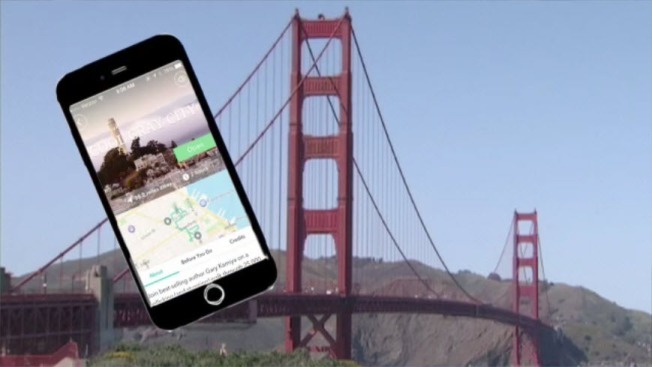 So far, the app has launched five tours in San Francisco, ranging from the Tenderloin to Fisherman's Wharf. There's also a tour titled "Trash," which is described as San Francisco's "at war with its garbage cans." The idea is to get people out discovering their cities instead of seeing a movie, Mason said. For now, the app is highlighting San Francisco, although there is one tour of Austin, Texas, and eventually it will roll out to other places. "There's been a massive learning curve," Mason said. "We've been baking all those rules into the creation software that we’re building so that for future generations of detour makers it’s all intuitive." Although Mason was on to promote the app, Quentin Hardy from the New York Times asked how it felt during the meteoric rise of Groupon. In 2010, Google offered Groupon $6 billion to acquire the daily deals company. The company refused. In 2011, Groupon was valued at $12.7 billion at its IPO, but it took less than 90 days for the company to burn investors and its IPO price to halve. Now the company is valued at less than $5 billion. "You get used to it, and you sit back and enjoy the ride," Mason said. "We live in a time where you can be a mediocre talent but there’s this amazing blank canvas called the Internet that has just recently come into being. I was so lucky to have had that opportunity and build something over such a short period of time." "Looking back, would you have sold it (to Google)?" Press:Here's Scott McGrew asked. "I thought at the time that the company was worth more than that," Mason said. "I continue to think that the company is worth more than that."